There is such satisfaction in setting a goal and then being able to accomplish it. 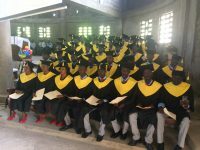 July 15, 2018, one hundred and fifty-one Haitian adults were rewarded for their hard work and completing the class they signed up for almost a year ago. Not only did they have to study and pass tests, but many of them had to walk for many miles in heat and sometimes rain. They had a goal of improving their lives and the lives of their families. Many of them have already started working at their new profession and feeling that pride of accomplishment. 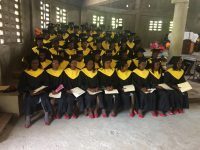 Congratulations to the 2018 graduates of Beyond Relief Trade School! Not everyone who has been working hard has reached their goal yet. Sewing is a two year class and this year’s first sewing students are just half way done. They are already using their skills. 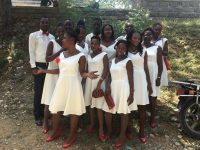 They made their own dresses, shirts and pants to attend graduation. Don’t they look great! Many of the students also helped sew the caps and sashes for graduation. 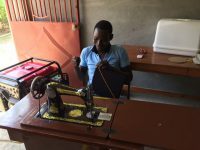 add a new solar system that will give us more electricity without having to pay the high cost of gas in Haiti. 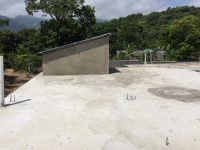 To prepare for the installation, a cement roof was put on the guest house. The solar system is scheduled to be installed in October by a Christian non-profit in Cincinnati, SonLight Power. We also want to say thank you to Cedar Creek Church in Perrysburg, OH for the donation of 11 laptops. These laptops will allow us to expand the computer class which is in high demand. David was not able to go to Haiti in July due to recovering from a broken leg. 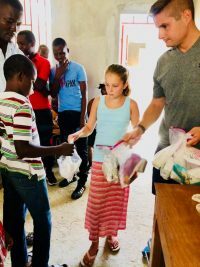 So Josh and Erin Kuntz plus their 6 children and Nick Shultz accompanied Rita to Haiti. They wanted to do a special project to help the community. Moms and their children were invited to come to a mini VBS and a health clinic. The mothers were given instructions on hygiene and nutrition. Each child was given a little kit of soap, antibiotic cream, vitamins, Tylenol and other items to help with the common health issues. Thank you Nick Shultz for contributing most of those supplies! What a privilege to get the opportunity to go to Haiti and to serve the Haitians. Beyond Relief and all of their supporters are truly making such a big impact in very many lives. Thank you for all the donations and prayers that you give!